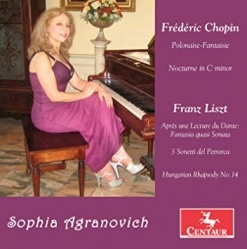 Chopin & Liszt: Piano Works is a collection of seven solo piano works by Frederic Chopin (2) and Franz Liszt (5) performed with a dazzling technique and an abundance of passion by Sophia Agranovich. It doesn’t take more than a few moments of listening to clearly understand why Ms Agranovich has been referred to as “the tigress of the piano” for her dramatic interpretations while also being highly praised for her sensitivity and the delicate nuances of her playing. A native of Ukraine, Ms Agranovich’s concerts were aired on national television and radio stations from the time she was six. She won the Ukrainian Young Artists Competition at the age of ten - the youngest participant in the competition. At thirteen, she performed the complete “Concerto in E Minor” by Chopin in Chernovtsy, Lvov and Kiev. At fifteen, Ms Agranovich began her studies at the Juilliard School in New York City and earned Bachelor and Master Degrees there. After graduation, she began working toward her Doctorate at Columbia University, but deferred that pursuit to raise a family. She has released seven albums since 2010 with a focus on the major composers of the Romantic era including Schumann, Schubert and Brahms in addition to Chopin and Liszt. She is also an acclaimed lecturer, chamber musician, adjudicator and master class clinician. An esteemed educator who has won many teaching awards, Ms Agranovich’s students consistently win top honors in regional, national and international competitions and are performing at prestigious venues. The album begins with Chopin’s “Nocturne in C Minor, Op.48 #1,” a piece that begins slowly and simply, gradually gaining momentum and catching fire as it unfolds, ending with a whisper. The second Chopin piece is “Polonaise-fantaisie in A-Flat Major, Op. 61,” which also begins quietly and gradually becomes more intense, alternating between powerful and more subtle passages - an epic performance! The next four pieces are from Liszt’s “Annees de pelerinage II,” #4-7. The title translates from the French as “Years of Pilgrimage” and these four movements are from the second of three suites for solo piano. Widely considered the masterwork and summation of Liszt’s musical style, all four pieces vary from Liszt at his most tender to his fiery, tumultuous virtuosity and showmanship, giving Ms Agranovich a means to demonstrate her own virtuosity and wide range of expression, which is beyond impressive. The last piece on the album is Liszt’s “Hungarian Rhapsody #14 in F Minor,” a dramatic and demanding work that Ms Agranovich seems to handle with ease. As I stated above, this album is beyond impressive. Since many of my reviews are for albums that are on the quieter side, I should mention that this music will not put you to sleep. It is meant to be listened to and savored with appreciative attention. You won’t be disappointed! Chopin & Liszt: Piano Works is available from Amazon and iTunes.